"A delicious dip for potato chips." In a small mixing bowl, combine cream cheese, mayonnaise, milk, Worcestershire sauce, and grated onion. too much worchestershire sauce. Very oniony. I added only 1 TB of grated onion for a more subtle flavour. This was really good. The cream cheese adds more depth to the flavor. Used a sprinking of onion powder instead of the onion and it wasn't too strong. 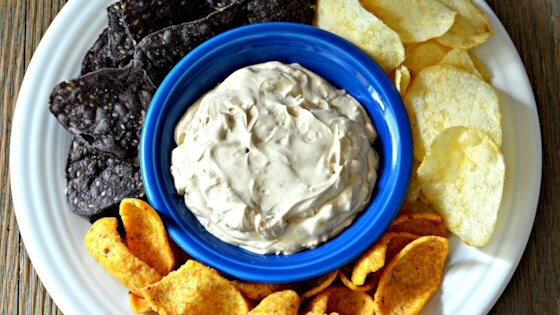 We used to make this dip often when I was a kid, only we added some catsup. It is still my favorite but I really like onions. great dip and so easy, I used fresh chives instead of onion and it was delicious.